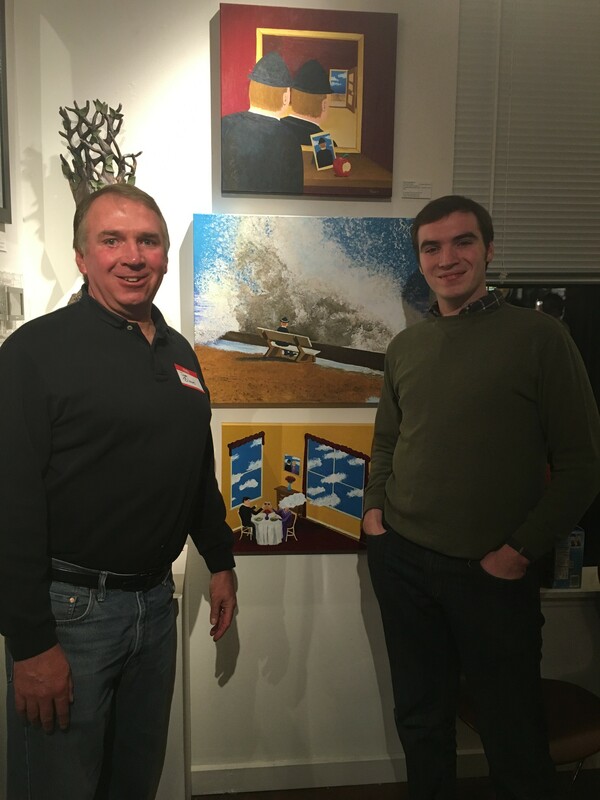 It’s always fun to have your art work on display. So participating in my fourth MySLArt.org show was a treat to be a part of and getting to meet and talk with other artists who are kind of in the same boat I am always makes for an interesting evening. I was impressed with the variety and quality of the entrants in this month’s show. 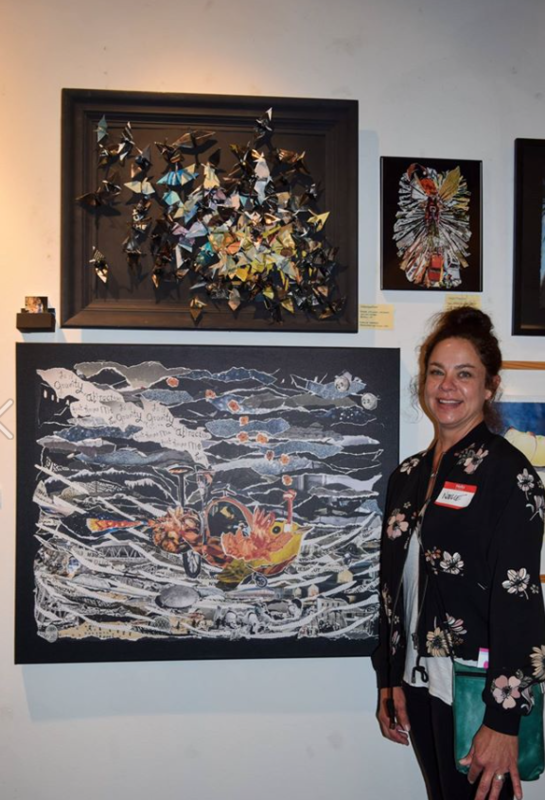 There’s truly something for everyone at these events and they’re a great outlet for artists who traditionally may not be quite gallery-worthy yet – and for others that certainly are. I enjoy seeing people walk up to my paintings, looking closely at the details and oftentimes, talking with others about what in the world is going on with what I’m showing. It’s also fun when people come up to me and say that my work reminds them of Magritte. That’s probably the ultimate compliment to me. As a painter, I am a novice, still learning, still trying to get better every time I start on a new canvas. Talking to other artists at the event, that’s their quest as well. 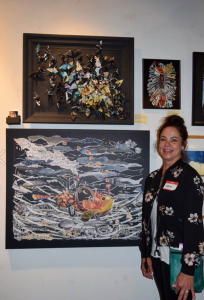 The Juror’s Choice award went to Noelle Wagner – and deservedly so. One of her works was featured as the key image for the invite and it was even better seeing it in person. Gorgeous stuff and she got my vote! Hat’s off also to Ulysses Sebastian, who received the Visitor’s Choice award for three compelling photographs that had a lot of people talking. I spoke to Ulysses (who recently changed his name) about his work and about his pursuit of creating photography that made a difference. That’s really what it’s all about – pursuing your passion, putting yourself out there and always trying to get better. I love to paint and even though the canvasses continue to stack up in our house, that’s okay. My best paintings are still ahead of me. These window banners can be seen at a variety of American Eagle locations all over the metro St. Louis area. 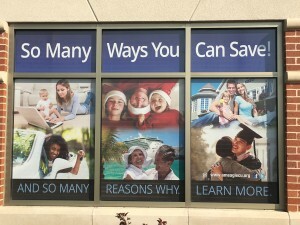 The assignment was a simple one – promote American Eagle Credit Union’s wide range of savings plans. Well, actually, that’s not as simple as it sounds because this wasn’t for a print ad or radio commercial or TV spot – it was for window signage at a number of their St. Louis area locations. We’ve worked on a variety of these assignments before for American Eagle Credit Union and the challenge is always the same – come up with a message that essentially works as an outdoor board. The assignment’s slightly more complicated than that due to the fact that our message actually gets spread out over six different windows (or four very large ones with their main location on Lynch Street). And all of those windows have dividers separating them, making it tough to split words between the windows. So we looked at all of the Savings account options. But then we also considered the fact that American Eagle helps you save money on auto and home loans – and you can save on credit card rates as well. Naming all of those in our limited space was not an option. So we boiled it down to one simple statement: So many ways you can save. 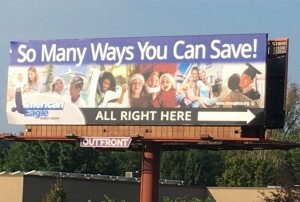 And we backed that message up by saying, “And so many reasons why” and then let the visuals pay off the copy – a retired couple on a cruise, saving for a new car, saving for college, saving for a new addition to the family – the reasons for needing savings plans are all across the board. It’s a short, simple message. And it worked so well, we were given the opportunity to make it work in outdoor as well. It’s a strong, simple selling message that is working to help promote American Eagle’s wide range of savings products. 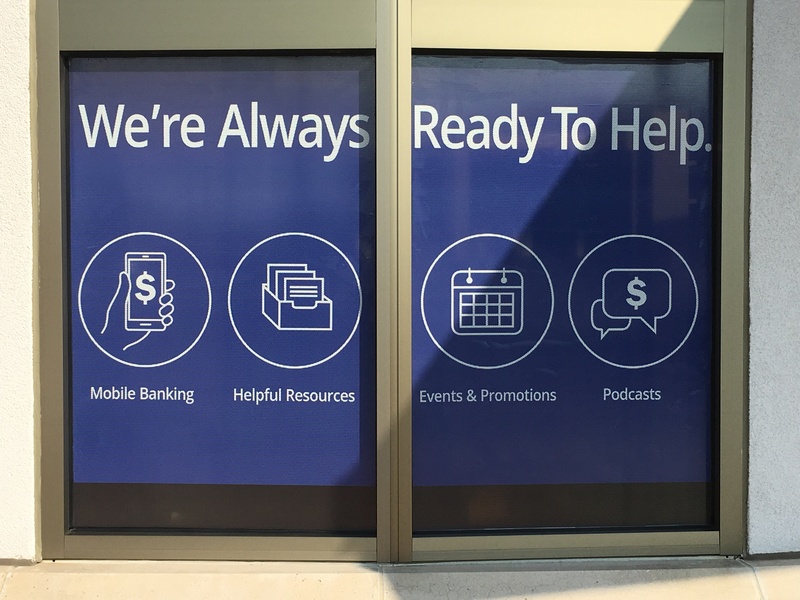 We even developed two additional messages for two smaller windows at their Des Peres location that remind members of additional ways that American Eagle helps them save – using icons from their newly re-designed website. 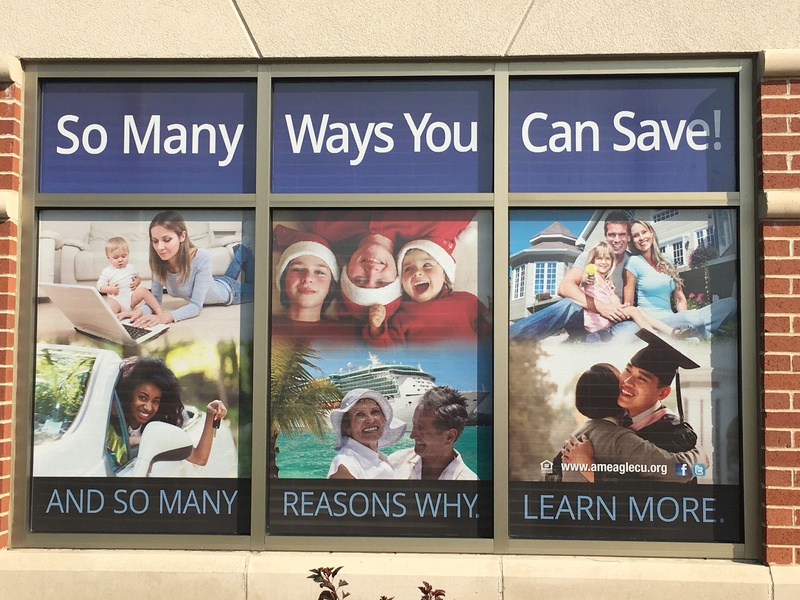 Two smaller windows allowed us to re-enforce American Eagle’s savings message utilizing icons from their newly designed website. So if you’re tired of being just another number at your current bank, consider American Eagle Credit Union. They’re always ready to help. BloodLInes Creative helps a wide variety of clients with whatever marketing challenges they may be facing with strategic, on-target messaging. What can we do for you?